The works of Kenji Yoshida, who has died aged 84 of cancer, could reduce viewers to a reverent silence or even tears. Those who came to know and love his paintings never lost their devotion. Yet in spite of some limited recognition, mainly in the western world, he remained largely ignored by critics, museums and galleries of modern art and art historians. Not obviously Japanese enough for western perceptions, not international enough for contemporary Japanese critics, he was unclassifiable and hence little mentioned. Yoshida was born in Ikeda, near Osaka, and trained as an art teacher. 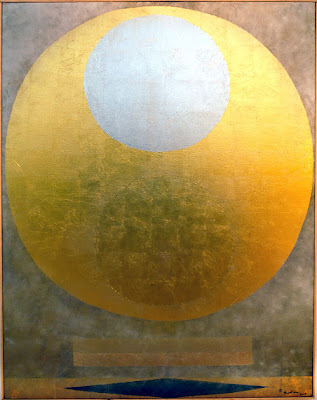 Much of his early life remained obscure to even his closest friends, but he often quoted his mentor Furukido Masaru saying: "Do not go to war, live", and it was no accident that almost all his mature paintings (after 1978) were titled simply Life. Nevertheless, he was conscripted in 1943 and, trained as a naval airman, was earmarked to be a kamikaze pilot. The defeat of Japan saved him, and in later life, when pressed, he said it had been his intention to crash his plane into the sea to avoid killing anyone else. Nearly 60 years later, his meeting with a British prisoner of war of the Japanese in Norwich cathedral was an unforgettable moment of forgiveness. Yoshida's magnetic personality - largely unhampered by verbal coherence in any language, including his own - achieved this without any obvious effort. After the war he continued to teach and to paint, but little is known of his style at that time. Then, in 1964, he left for Paris, a magnet for Japanese artists since the 1890s. He began to study graphic art techniques with the Hackney-born sometime surrealist, abstract impressionist and printmaker Stanley Hayter at his influential Atelier 17 studio. Yoshida lived in Paris for the rest of his life, rarely returning to Japan. 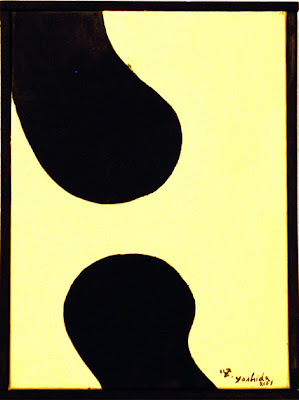 His abstract colour etchings from 1964 show Hayter's influence, but they already had an inner incandescence, which gained him modest sales, many of them with Atelier du Nord, a group of young mainly Scandinavian artists based in Paris, through which he got a bursary from the Norwegian government. A groping towards larger, clearer forms is first seen in a distinguished group of serigraphs (1972-76) in which unmuddied colours signal an already individual sensibility. 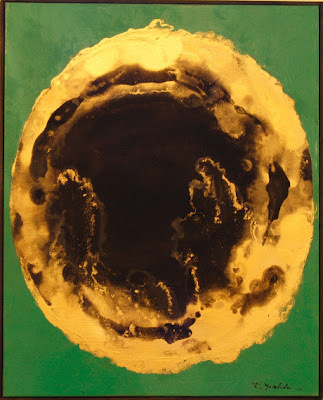 Meanwhile he had been painting on paper much of the time, first in a recognisably abstract expressionist style on a small scale, but after 1984 he devoted himself almost entirely to ever-bigger works in oil on canvas, usually incorporating gold, silver or platinum leaf in the Japanese tradition. Their themes became increasingly cosmic and mystical, often seeming to be portraits of the created universe itself. To accommodate his need for a sense of movement, he expanded into huge multi-panel compositions. Of these, perhaps the greatest, was his 12-panel "chapel", the outside inscribed with Chinese Buddhist sutras in Yoshida's own pungent calligraphy. This was shown in Christ Church cathedral, Dublin (2000), Norwich cathedral (2002) and Canterbury cathedral (2003); stretchedout to a continuous composition, it was shown last year in the Unesco Hall in Paris, his only solo showing in the city of his adoption. He never had a solo exhibition in Japan: his major exposures were at the British Museum (1993), thus becoming the first living artist to have a retrospective there; the National Museum of Modern Art, Mexico City (1997); and the Château de Blois (2006). Yoshida's paintings were his obsession, but they did not stop a vigorous bohemian social life and much travel, where his charm and integrity always made him friends. His personality was as unclassifiable as his work. His last visit to his homeland was for a few days, just before his death. His ashes will be interred with those of his wife Hiroko, who died in 1986, in the beautiful tomb he designed for them both in Montparnasse. His daughters Kiyoko and Yoko survive him.